A set of concepts – Words (or phrases) that represent a thing such as an animal, a medical procedure or business process. A controlled vocabulary – A special set of agreed upon words with definitions common to the community. A taxonomy – A list of those specialized vocabulary words in a generalized parent-child hierarchy. A thesaurus – Shows how those words (concepts) are associated and equivalent. It also provides hierarchical information about narrower or broader terms. A schema – A specification for organizing and defining data, its’ properties and relationships. Theories – A set of business, professional or research axioms…things that are true. The word ontology is often used to refer to all, or to selected subsets of the above items. A generic or high-level ontology that describe a goal, a policy, a general medical or business concept. A community ontology that describes a vocabulary related to a particular medical specialty. A task ontology that describes a medical procedure, problem solving processes or a business activity such as record keeping or patient billing. An ontology can be simple or complex…they in fact can provide varying levels of precision depending upon their make up. An ontology with a controlled vocabulary and a taxonomy is of limited value without the relationships defined in the thesaurus. If you add a scheme and theory the ontology is of greater value and usefulness. A word can represent a person, place or thing. 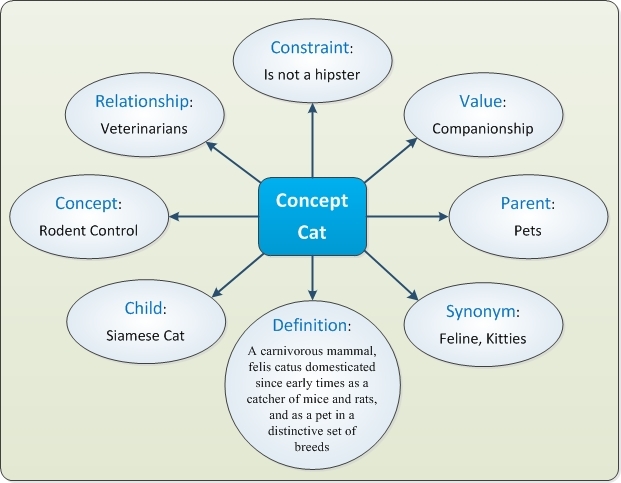 In the example below, the concept cat has relationships with other concepts; cats can be defined by sub species, cats can be classified in multiple ways, cats have value, the concept of “cat” has a constraint – in this case it is not a hip human being. Bird – A member of the class Aves, which include warm-blooded, egg laying feathered vertebrates with forelimbs modified to form wings. Blue point – A type of Siamese cat with lighter coloring of the ears, face, tail and feet. Dog – A domesticated mammal, canis familiaris probably derived of wild species. Ferret – A weasel like mammal, mustela nigripes of central North America. Hamster – Any of several Eurasian rodents of the family circetidae. Pet – An animal kept for amusement or companionship. Siamese cat – A short-haired cat of a breed developed in the orient, having blue eyes, a pale fawn with darker ears, face, tail and feet. Seal point – A type of Siamese cat with dark brown coloring of the ears, face, tail and feet. Turtle – Any of the reptiles of the order chelonian. A preferred term is the one word that a majority of people in a community know and use. A preferred term in a thesaurus is selected from among all synonyms to be the one used for consistent labeling, indexing and retrieval purposes. For any hierarchy there is one and only one Top Term. For example, automobile, car and motorcar can describe a 1963 Ford Falcon. Only of these terms can be used as the primary label when describing a concept in a taxonomy with a thesaurus. A related term indicates two or more words have some sort of link but may not have any special significance other than that there is some relationship. These relationships can be alternative spellings (color vs. colour), plural spelling, alternative endings, abbreviations and acronyms. An equivalent term is a synonym. Automobile, car and motorcar are conceptually equivalent. In this example automobile is the preferred term, and term car and motorcar are equivalent variants that represent the same concept. hierarchical terms indicate a relationship that may not actually be reflected in the taxonomy. They are either broader concepts (general) or narrower (specialized) instances of a term. They are shared relationships on the borders in the hierarchy. In the sample thesaurus below, the South Shore is a narrower term for Massachusetts, but may not be represented as a parent-child node in the Taxonomy. Scope notes are comments that provide a textual explanation for a term. This note is attached to a term in a controlled vocabulary, and provides guidance on how to use the term. Scope notes perform a variety of task; they can detail grammatical usage, disambiguate definitions, include or exclude concepts for the term and clarify relationships. Equivalent term – MA, Mass. Things that are always true. It’s those rules that govern how a community interacts; it’s how a medical procedure is executed, or how a business process actually functions. 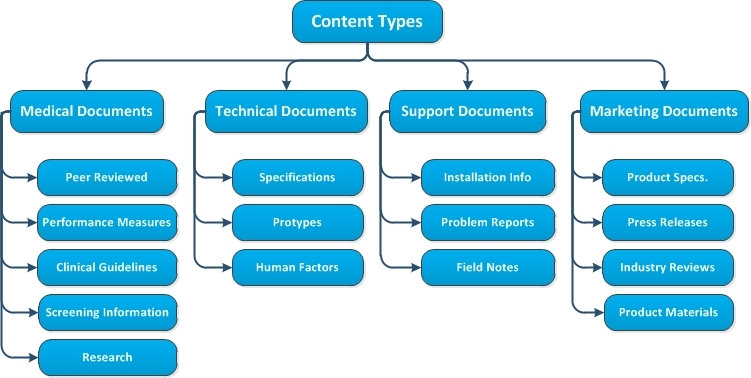 A theory can also determine whether a document belong to a category in a taxonomy. Purchase orders are always prepaid for overseas shipments. 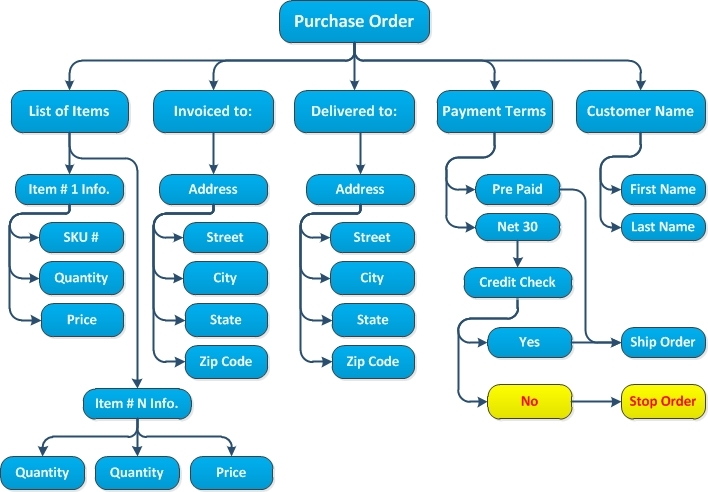 If a payment is made by credit card, and the invoice address is not equal to delivery address, than check credit card number against the fraud list. Credit terms are not granted without a positive credit check of 700. Shipments are not made to PO Boxes. All shipments are conveyed by UPS. When an order is shipped a tracking number is sent to the customer by email only. If you would like to find out more about optimizing content for the Enterprise send me an email at Mark@MSprague.com or call me now at 781-862-3126.